Crickets are familiar members of the insect order Orthoptera, which also includes the grasshoppers and katydids. Members of this order all have large hind legs modified for jumping. Crickets become very noticeable in the autumn. As the days shorten and the temperature drops, they focus on laying eggs for next year because all the adults will perish come winter. Crickets use sound to find a mate and so the loud choruses of chirping males begin. Because they typically inhabit cracks and crevices, they often find their way inside our houses by exploring around the foundations and exterior doorways of our houses. The warmth within is agreeable to them and, as far as a male cricket is concerned, our houses are good echo chambers to make themselves louder! The males make their familiar chirping sound by rubbing special structures on the wings across each other. In principle, it is like running your thumb down the teeth of a comb. If you observe a singing male, you will notice his wings fluttering over his back. On one wing is a sharp ridge called the scraper. On the other wing is a series of wrinkles called the file. As these are drawn across each other, the chirp is created. The tone of the chirp is related to the structure of the wings and how far apart the wrinkles of the file are. The frequency of the chirping varies according to temperature. It is possible to get a rough idea of the outside temperature in degrees Fahrenheit by counting the number of chirps in 15 seconds and adding 37. The females listen to the chirping of the males and pick the best "singer." A cricket's ears are just below the "knees" of its front legs. They consist of openings in the exoskeleton that lead into chambers inside the leg. By facing one way or the other, the cricket can tell which direction a sound is coming from. 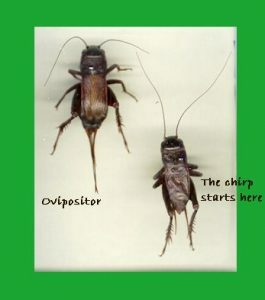 Crickets make several different chirps. The loud monotonous one we hear outside in the evening serves to attract a female. Another is made when a male knows a female is near and is softer and quicker. Yet another is made when two males encounter each other. There is even a "Look out!" chirp that warns all the others to be quiet because danger is nearby. The careful listener can pick out these individual dramas by listening for the different songs. After mating the female will look for a place to lay her eggs. The female uses her long egg-laying tube (ovipositor) to place her eggs one at a time in soil, decaying wood or other suitable medium. The baby crickets hatch the following spring. They undergo gradual metamorphosis, starting out as a tiny version of the adult and then going through about 10 molts before they reach maturity. This takes about 12 weeks, giving the potential to have two broods per year in Kansas. If conditions are favorable, that will result in lots of adult crickets in autumn. While we often think of a singing cricket in the house as a nuisance, in the Orient it is considered a thing of beauty. A singing cricket may be kept in a fancy little cage much as a bird would be. As the winter approaches, the annual cycle of insect activity on the Great Plains comes to a stopping point. In one form or another, they must hibernate through the cold months. The chirping crickets of autumn are just trying their best to make sure that plenty of their own kind will be there to greet the spring. visit the Singing Insects of North America.